The Solent Sunbeam is another classic, dating from 1923 designed by the late Alfred Westmacott and were originally built by Woodnutt’s Boatbuilders at St Helens in the Isle of Wight. Built of pitch pine on an oak frame. The first of the fleet was “Dainty” sail number V1 built in 1923 and is still racing. This year 2016 was the 51st Consecutive Cowes Week regatta that V1 Dainty has competed in. 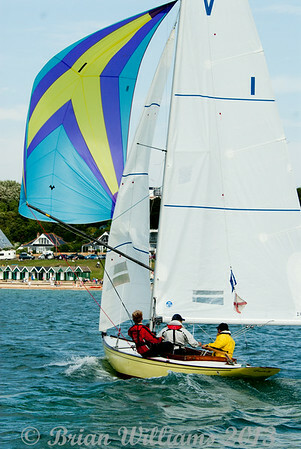 Since 1923 about 70 Sunbeams have been built, the class maintain two racing fleets, the Solent fleet is based at Itchenor Sailing Club. The other fleet is based at The Royal Cornwall Yacht Club in Falmouth. These yachts are a joy to watch racing, each yacht has its own individual hull colour, the Solent fleet use bright coloured spinnaker.